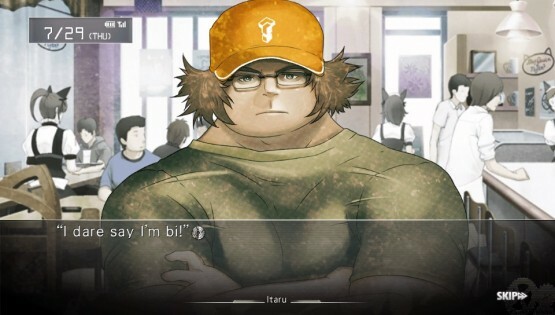 Steins;Gate already has a bit of a history in the West. The PC release was given a localization last year, and the anime adaptation has earned rave reviews from audiences. This is the first time the popular story has appeared in playable form on PlayStation platforms, though, and these versions are more than worth a look if you haven’t already experienced this tale elsewhere. 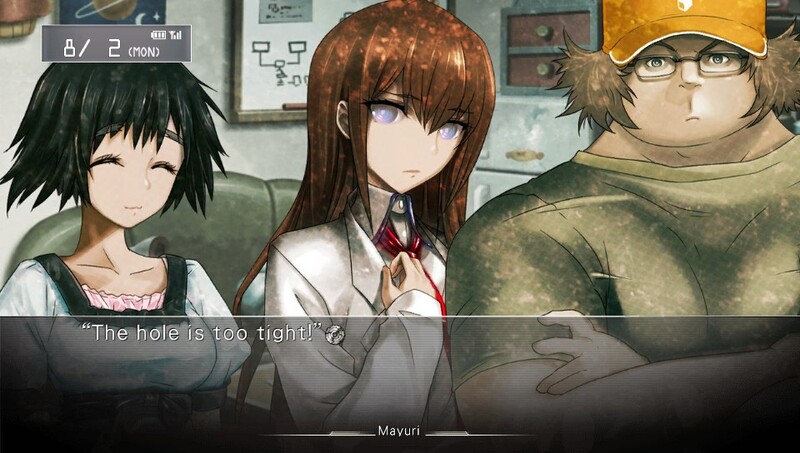 Being a visual novel, there’s obviously a heavy emphasis on narrative and character in Steins;Gate, and this area does not disappoint. The game follows eccentric youth Okabe Rintaro and his friends at the “Future Gadget Laboratory” (read: a tiny apartment above a third-rate CRT store that never gets any business). The group accidentally creates a time machine with one of their goofy inventions, and eventually uncovers information about a well-known research institute performing similar, intentional experiments. Time travel is one of those ideas that treads dangerous literary ground: it can be a terrible plot device when used improperly, but it’s intriguing and viscerally satisfying if rules are established and followed. 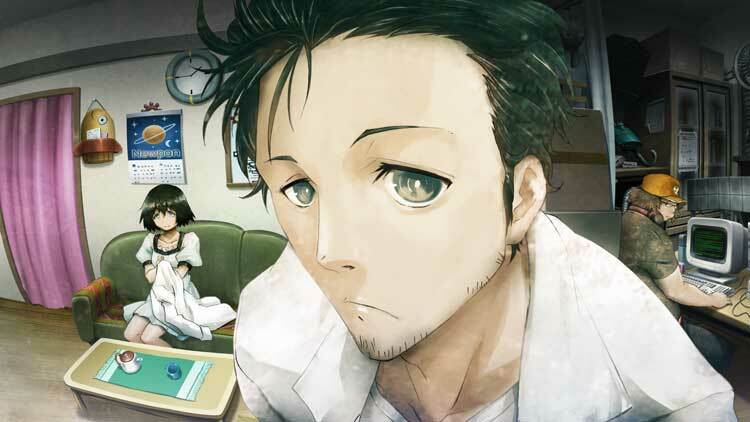 Steins;Gate does the latter; it doesn’t just toss time travel into its plot as some cheap gimmick, it fully integrates the concept and related themes into the very foundation of the story. There’s even a lot of explanation behind the science of the phenomenon in question, even if some of it has to be fudged to spice up the fiction. Even better than the science are the references brought in. Again, these aren’t lame allusions to pop culture tossed out for a cheap laugh — they’re built into different parts of the narrative, adding to the characters’ personality and the lore of the world. For example, the John Titor hoax (in which a man claimed to have traveled back in time from 2036 on the internet) really happened, but Steins;Gate takes this interesting fable and runs with it, making the figure a key part of the intrigue. Then there’s “@channel,” a not-so-subtle nod to infamous imageboard 4chan. It would be so easy for the writing here to overplay it and ring false, but it’s strikingly accurate, reflecting the same sort of nihilism and antagonistic humor that’s common on Internet forums. That brings us to the topic of the localization, which is phenomenal. The text finds a unique voice for all the characters, and the writing is frequently hilarious. These personalities rely on some well-worn archetypes, to be sure, but their words and actions transcend these tropes. A sign of good fiction is that indescribable feeling of companionship you get when you return to read about people that don’t really exist, and that’s here in spades. It’s also nice to see winks and nods to anime tropes and otaku culture in a genre that so often relies on them without a shred of self-awareness. Like the best localizations, these are retained and given explanation rather than changed for Western sensibilities, and the text is richer for it. While most of the writing is successful, there are a couple of problems with the story that can make it an occasionally exhausting read. These aren’t the fault of the localization, but rather a few questionable choices on the part of the original script. The first of these is the plodding pace. This is a slow story that focuses a huge amount of time on unimportant details, for better and worse, especially as the story begins with a trudge through a vast expository swamp. Being the eccentric narrator he is, Rintaro spends laborious swathes of text giving you his thoughts on absolutely everything. He has an internal retort or quip for every situation, and while a lot of this is humorous at first, it makes a lot of conversations take longer than they’d otherwise need to. There are also a fair few scenes bogged down by excessive explanations. These are necessary to some degree, as they elaborate on the scientific background fueling the narrative. Even so, these can really overstay their welcome — it’s not uncommon for a segment of scientific jargon to run 30 minutes of reading or more. They’re written at a drier, more technical level that clangs against the otherwise buoyant tone of the narration and dialogue, and don’t feel as universally accessible. These complaints, while definitely impacting the flow of the story, are still fairly minor and will be easily overlooked by those who find themselves engrossed by the colorful cast. That just leaves one order of business, which is the “gameplay.” That almost feels like a misnomer, since the player’s input is fairly minimal, but make no mistake — your choices have an impact on the story. 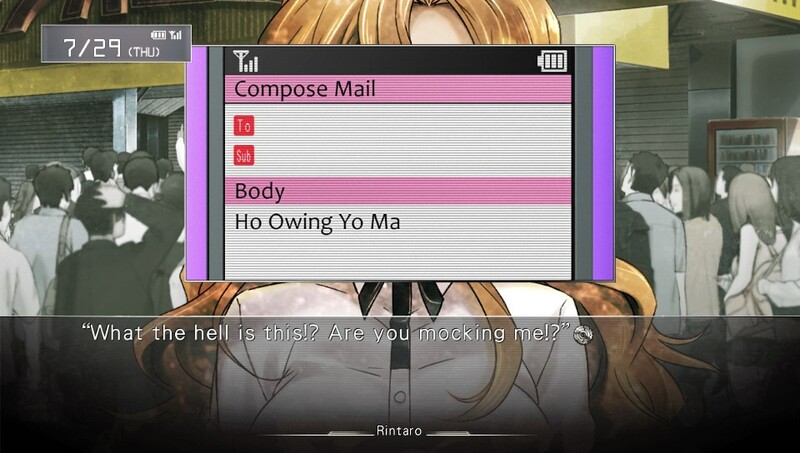 Steins;Gate uses something called the “Phone Trigger” system. At various points, often smack-dab in the middle of other events, you’ll receive calls and texts from the other characters. You can choose to respond or not; if you pick the former, you can respond to one of the topics at hand by selecting a highlighted bit of text. Rintaro will come up with a response of his own accord based on the context. This system, while intriguing, does have a couple issues initially: first, you’re never exactly sure what Rintaro will choose to say until you’ve already made a selection (at which point it’s too late to return). You can use quick saves and loads to see all the choices, but this is a bit unwieldy; would it really have been so difficult to let Rintaro erase his draft and start over? Beyond that, Phone Trigger suffers from being a little unintuitive, a problem not uncommon for visual novels. That is to say, you’re not exactly sure how your responses have any influence at first, and what they represent in terms of choice. This becomes clearer as the story progresses, but that leaves your first 10 hours of play or so in relative discomfort. You’re hoping that conversation about rock bands doesn’t somehow lead to the world’s destruction. Again, though, this feeling is only temporary. As the plot unfolds, this discomfort leads to a knowing satisfaction. It’s a rich tale filled with suspense, curiosity, and characters you really grow to care about. After all, as nauseating as the overwritten sections can feel, the writers’ insistence on fleshing out their characters to a point of almost comical detail is what makes them so endearing. The story’s imperfections are always there, but this is a story about highly imperfect individuals who make a lot of mistakes. Fans of fellow Vita visual novels like Zero Escape and Danganronpa should make this a priority. They might miss the heavier emphasis on gameplay in those titles, but on the other hand, there are no distractions from the rich narrative. 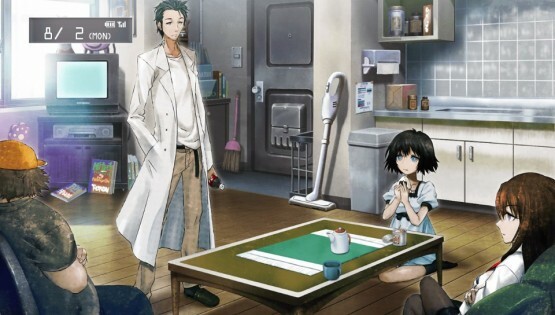 Time travel is very hard to do right in fiction, and Steins;Gate is an exemplary instance of this intriguing concept given the attention and care it deserves. Review copy was provided by the publisher. For information on scoring, please read our Review Policy here.